Auto Insurance Costs Too Much! Insurance rates make no sense! That's a darned good question. FCAN and Consumer Federation of America are conducting research into insurance pricing and have produced some surprising results. 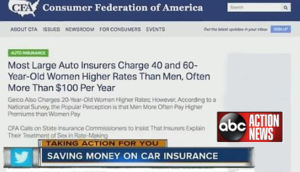 For instance, our data shows some companies charging "Female motorists with perfect driving records often pay significantly more for auto insurance than male drivers with identical driving records." 1 What? Don't we all understand that men are the more aggressive drivers and are higher risks on the road? It goes even further. According to the same study, "GEICO charged young female drivers more than young male drivers in nine of ten cities. " They can’t explain why. Our research is showing other anomalies in the pricing of auto insurance. A second analysis concluded, "Progressive and Farmers usually charge the same rates to someone who drives only 2,500 miles a year as they charge someone else who drives 22,500 miles a year. "2 We all know that insurance companies ask us the mileage often, even check odometers, and never fail to get us to estimate our commute to work. But then they don't even use the information? It doesn't make sense. Right! So what are they doing? Unfortunately, we don't know. Insurers today use highly sophisticated computer programs to price their insurance products, and the exact algorithms are top secret proprietary information. We call those "black boxes." The rates make no sense? We know that insurers use information like credit scores, level of education, and employment status to determine what to charge -- even though they cannot show how those factors affect your driving. But even those things don't explain the results shown in our studies. You may find this startling, but our experts, so far, don't have a good answer. We think it may be that the insurers cannot control their own super computers and don't understand the results they are getting. GEICO Charges 20 year old women more than men? This can't be legal, right? They can't just make up numbers can they? Well, maybe it is legal. The Insurance Commissioner is unable to explain the rates3. FCAN is calling on the Insurance Commissioner to get answers from the insurance companies explaining these prices. 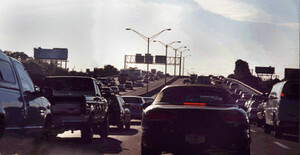 Lower Rates for Good Drivers FCAN is pushing for a new type of auto policy based on a person's actual driving record. We are pushing for basic auto insurance for low and moderate income Floridians with good driving records that will cost less than the computer priced policies. If you don't have any accidents or tickets, why should you be paying a higher rate? It just makes sense: basic insurance for good drivers at reasonable rates. We’ll have less uninsured drivers and another incentive to drive safely. Email Florida Insurance Commissioner David Altmaier at InsuranceCommissioner@floir.com Ask for an explanation of the rates and ask for basic insurance for good drivers. Download a copy of the auto insurance fact sheet here.